Jenson VanCise is Head Coach and Competitors Coach of Perdido Bay CrossFit. Jenson is a native of Titusville, Pennsylvania. He holds an Associate of Applied Sciences in Fire Science from the Community College of the Air Force. Jenson retired from the United States Air Force in 2014 after devoting 19 years of service as a Fire Protection Journeyman. When not coaching at PBCF he is a career firefighter with Midway Fire District. He has over 25 years of firefighting experience and has held nearly every job within a fire department. He was deployed numerous times in support of Desert Shield, Iraqi Freedom as well as operations conducted in Bosnia, Africa and Afghanistan. 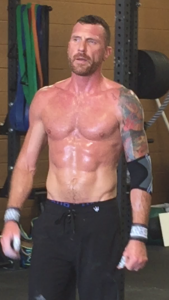 Jenson began CrossFit in November 2011 and started leading/coaching WODs in March 2013. After receiving his CrossFit Level 1 certification, Jenson saw an opportunity to improve the physical training program for the fire department he was assigned to. The department quickly saw improved official PT scores. Before he retired he oversaw the ordering, purchase and installation of CrossFit equipment for his fire department. Jenson is a CrossFit Level 2 (CF-L2) Trainer and holds Mobility and CrossFit Kids certifications through CrossFit. Jenson participated in sports from childhood, to include, baseball, soccer, cross-country running, track and swimming.